Just do it. Make it happen. Seize the day. If only it were that simple. We put so much emphasis on defining and declaring what we want out of life, and so little emphasis on dealing with where we actually are in life. We all have dreams. We want to chase those dreams. The dreams are the destination. The dreams are where we want to go. But right now we have obligations. That’s where we are. Our obligations are our location. And many of us feel stuck there. So how do we get from where we are to where we want to go? From our location to our destination? With a life strategy. I grew up in suburban America, playing video games and eating junk food. Flash-forward a few decades, and somehow I found myself living in Jerusalem, Israel, with a wife, a few children, business debt, a lot of commitments, PTSD, and unfulfilled dreams. I’m a total loser and there’s no way I could make a plan for my life. It’s impossible to plan anyway, because the circumstances of life are too demanding. These lies were constantly being reinforced by the culture and media I surrounded myself with. The movies I watched, the music I listened to. All telling me that life was hopeless anyway, and I should try to comfort myself as quickly and easily as possible. Believing these lies caused me to suffer from depression, addiction, weight gain, fits of rage, and anxiety attacks. It was not a sustainable lifestyle – not for myself, and not for my family. Are you believing these lies too? One day I was feeling particularly empty and exhausted. I had no vision for my life. So I made a decision. I decided to write exactly what I wanted in life. To write out, on paper, in words and pictures, my dream. It was a surprisingly relieving process. It didn’t take too long, and it was fun to do. They weren’t excessive in number. They were just a handful of things. They were surprisingly reasonable. They were challenging, inspiring, but not impossible. I had finally defined the destination. But what about my current location – my obligations? This is where things got tricky. I needed a plan to reach the destination. And over the next 5 years I worked on that plan. Today, I have a life strategy that consists of overarching themes, annual goals, and weekly planning. I have criteria that tells me whether to accept or reject any new opportunity that comes my way. And I’d love to teach you to create a life strategy too. 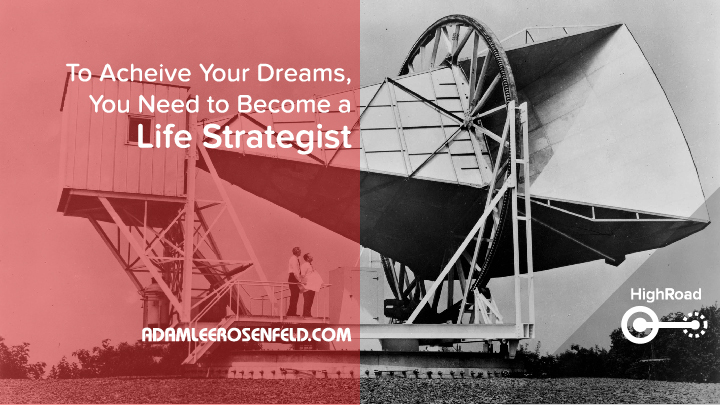 But first, you, like me, need to believe that creating a strategy for your life is possible. Good question. There are too many things to account for, and we are weak human beings who could not possibly assume control over the chaos of our everyday lives. However, there is someone who can be in charge of our lives. He is the one who created us to begin with. And the only way to properly create a life strategy is to bring it to His feet, daily. Maybe you’re not in charge of your life, but you still are responsible for your life. Sounds crazy, right? How can some higher power be in charge of our lives, leaving us with the responsibility? This only works when there is absolute trust – you trust the higher power you submit to, and then proceed to lead your life to the best of your ability. Remember, there’s only one higher power that works. If you want, you can submit your life to any kind of power you can think of. You can worship statues or celebrities. But make no mistake, you are placing your absolute trust in them. And when they let you down, it can be devastating. You must be aware of your time. Your daily, weekly, monthly, and annual rhythms. You must review these regularly and take responsibility for them. Wherever you live, you live there for a reason. Your country, your city, your community. Your life strategy can help you embrace that positioning. Or it can also help you improve your positioning by moving elsewhere. Do you think that if you’re in debt, that you don’t have anything that’s your own? Think again. Not only do we have assets (monetary and otherwise), but we also have our own physical strength and skills, and our own thoughts and ideas. Our riches, our strength, and our wisdom. These are valuable, and we’re responsible for them. It’s up to you to define what it is you want out of this life. Once you do this, you’ll be surprised to see how reasonable it is. And you’ll be able to lead others on the journey of life strategy as well. I’m a life strategist. And I’m here to help you become a life strategist too. I’m here to help you define your dreams and obligations, so you can change the world while paying the bills. I do this with the HighRoad method. I developed the HighRoad method over the past five years. It provides you with five stages of definition for your life, so you can define your dreams and your obligations. HighRoad is my life strategy. It takes minutes to learn, and you can use it for years. And I’ve put it all in a free ebook that you can download by clicking here. 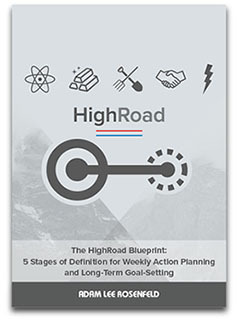 Looking for more in-depth training on the HighRoad method? Make sure you’re subscribed to my mailing list, and you won’t miss out when it becomes available. Is there an obligation that’s holding you back from reaching your dream? Let me know in the comments below! Awesome and inspiring. Thanks for sharing your personal story. Can you share with me whom you wisely choose to serve. I believe that choice influenced your success. Thanks Abigail – I serve God!